A BROTHER of former DUP government adviser Stephen Brimstone has been linked to Stormont’s controversial Renewable Heat Incentive (RHI), The Detail can reveal. This comes just days after party leader Arlene Foster said that Stephen Brimstone, who last month resigned as a DUP special adviser (Spad) in the Executive Office, availed of the controversial scheme. The party had already confirmed that a brother of current DUP Spad Andrew Crawford also accessed the scheme, with the botched green energy initiative expected to cost Northern Ireland’s public purse over £400million after a failure to cap subsidies. 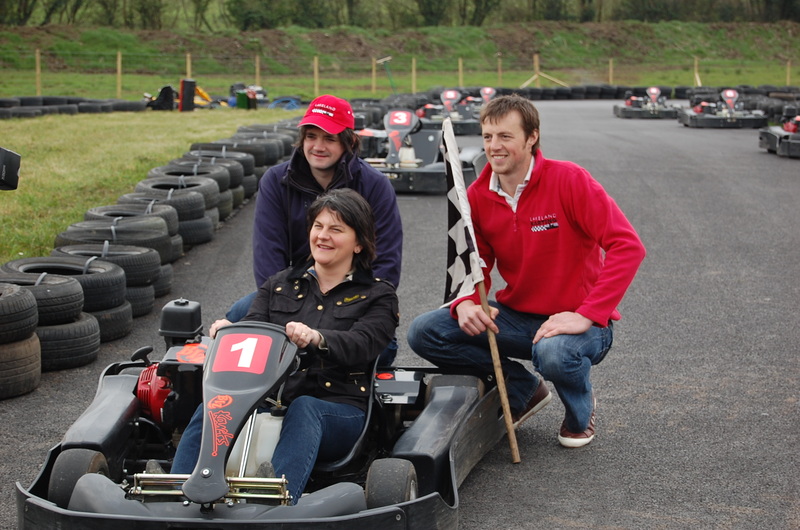 Now The Detail has discovered that Lakeland Karting in Kesh, Co Fermanagh, is a further recipient of the RHI. The director of that business is Aaron Brimstone, a brother of Stephen Brimstone, and husband of former DUP councillor Alison Brimstone who replaced Arlene Foster on Fermanagh council in 2010 but left in 2014. There is no allegation of wrongdoing against the couple or their business, which Arlene Foster helped officially open in March 2012, as promoted by the company here and here. According to Waterford-based renewable energy company, Enerpower, it installed a wood pellet boiler at Lakeland Karting under the RHI scheme. Enerpower’s website carries a case study of its work at Lakeland Karting and writes: “The new karting buildings, as well as a large domestic dwelling are now heated by a Gilles HPK-RA 45kW boiler which is fuelled by wood pellets. "Under the RHI Scheme the owner earns money from the government for every kWh used." It adds: "The Gilles boiler now saves our customer 2/3 on their energy cost while earning our customer money too! "The boiler has proved very reliable for Lakeland Karting while displacing 50 tonnes of CO2 per annum." There are no allegations of wrongdoing against Enerpower which declined to comment further. Despite the contractor mentioning both the karting business and a domestic dwelling, there is no indication whether the RHI scheme referred to was the domestic version of the scheme or the more costly non-domestic version. When The Detail contacted Lakeland Karting, both Aaron Brimstone and his wife Alison declined to comment. The DUP was also asked for a comment but it declined, saying it was not "privy to details of who is on the list of applicants or not". There is a particular focus on how nearly 1,000 applications were made to the RHI scheme in the three months before financial constraints were eventually put in place after late 2015. There is no confirmation of when Lakeland Karting applied to join the RHI, but the case study on the Enerpower website is dated as June 2016. Critics have called for Mrs Foster to resign over the RHI scandal, as it was introduced in 2012 when she was energy minister. The scale of the financial burden makes it the worst failure of its kind in the history of Northern Ireland's devolved government, but Mrs Foster said she has done nothing wrong and is committed to minimising the impact on public funds. The Northern Ireland Assembly has been rocked by a series of revelations around the RHI scheme which was put in place by the Department of Enterprise, Trade and Investment (DETI) when it was headed by the current First Minister and DUP leader Arlene Foster. The controversy centres on the failure to cap subsidies in Northern Ireland, despite a cap being in place on a version of the scheme previously implemented elsewhere in the UK. Recipients of RHI received funding that exceeded the cost of the fuel, but with no financial cap in place beneficiaries could legally profit from their involvement. As anyone accredited under RHI is entitled to financial support for 20 years it is estimated the flawed scheme could cost the public purse more than £400 million in Northern Ireland, with wider costs to central government at Westminster pushing the price tag to over one billion pounds. The RHI, which opened in November 2012, was aimed at acting as a financial incentive scheme designed to increase the uptake of renewable heat technologies and reduce the UK’s carbon emissions. The non-domestic RHI scheme saw around 2,000 applications approved, representing a 98% approval rate. A total of 984 applications were received in just three months ahead of officials eventually implementing a financial cap. A whistleblower first contacted Mrs Foster in 2013 over concerns about the RHI. Mrs Foster said she forwarded the matter to her civil servants. The scheme was finally closed to new applicants in February this year by Minister Jonathan Bell, the DUP minister who succeeded Mrs Foster in DETI. An investigation of the scheme by the Northern Ireland Audit Office resulted in a damning report in July this year. The report gave the example of a farmer it said is in line to receive £1million of public money over the next 20 years for heating an empty shed. Stormont’s Public Accounts Committee (PAC) is due to meet today to consider a request from a committee member to ask the First Minister to appear before the committee to answer questions on its inquiry into the non-domestic RHI scheme. Meanwhile, following new claims over Mrs Foster’s handling of the scheme, the First and deputy First Minister last night issued a statement seeking a recall of the Assembly next week to address the crisis. First Minister Arlene Foster and deputy First Minister Martin McGuinness said: "This will facilitate a full statement to be made by the First Minister to Members on the matters of public concern relating to RHI. Stephen Brimstone was at the centre of a Stormont inquiry into claims of political interference in the Housing Executive in 2013 and its contracts with the Red Sky firm. Mr Brimstone was a DUP spad to the party’s then Social Development Minister Nelson McCausland. Former DUP councillor Jenny Palmer, who has since joined the rival Ulster Unionist Party, accused Mr Brimstone of exerting pressure on her to change her vote in a Housing Executive board meeting. The vote concerned the termination of a lucrative maintenance contract belonging to Red Sky. The party denied wrongdoing and in the wake of the affair Mr Brimstone was promoted to become a special adviser in the Office of First Minister and deputy First Minister. He worked alongside Peter Robinson, who was DUP leader at the time, but Mr Brimstone was retained when Mrs Foster took power. Mr Brimstone’s surprise resignation from his role at the heart of government was made public in late November this year. His party said there was no link between the RHI and his resignation.